The Jaguar I-Pace has the teeth and claws to shred its electric opponents. With 298 miles between recharges and 0-62mph in 4.8 seconds, the I-Pace makes for a superb all-rounder. As good to drive as it is to look at. Whenever conversation gets around to premium-badged battery electric vehicles (BEV), there’s only been one name on anyone’s lips. Until now. Tesla is about to have its nose put well and truly out of joint and by one of the least likely sources: Jaguar. 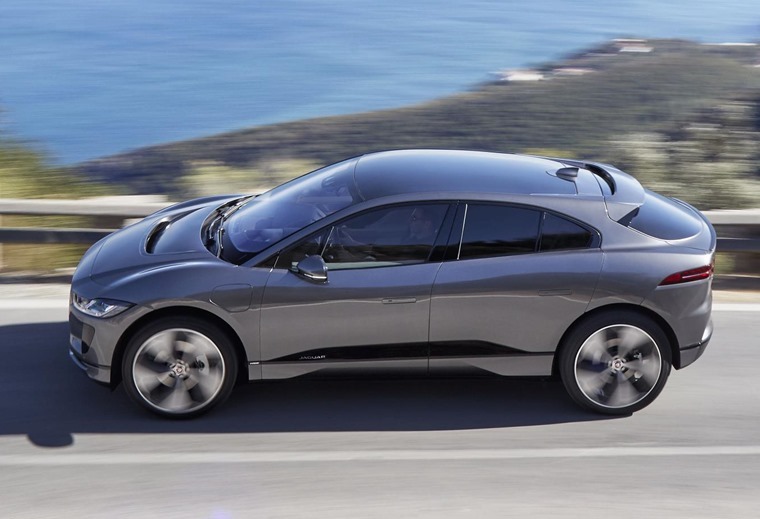 While Audi, BMW and Mercedes beaver away with their electric cars, Jaguar has got out of the blocks first with its I-Pace. Not only is it up and running before its traditional competitors, it’s more than up to the job of giving Tesla a fright. We’re not talking about the hype surrounding the Model X and Model 3 and any problems these cars might be experiencing with production. Nope, in a straight fight, the Jag has the teeth and claws to shred its opponent. Our test car rode on 20in wheels with low profile rubber, so cornering ability was not likely to be in doubt. Yet it’s the way the I-Pace feels sporty in the same way as an XF that impresses. How so? Well, compare prices and the I-Pace S costs from £63,495 and comes with a 90kWh battery. That means it can deal with 0-62mph in 4.8 seconds, hit 124mph and has a real-world range of 298 miles between recharges. 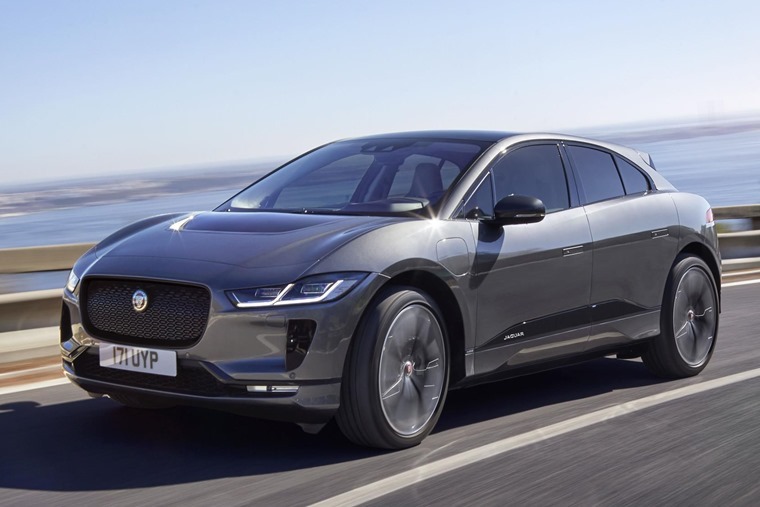 Look at the Tesla Model X and you need to plump for the 100kWh model to match the Jaguar’s speed off the line, though top speed is raised to 155mph and it claims to cover 351 miles before you need to plug it into the mains. However, the I-Pace’s range has been calculated using the new WLTP method and Tesla’s hasn’t, so we’ll call it even on that score. Where the Model X loses out is on price as you’ll need to fork out £88,105. That’s £25,000 more than the Brit, which is a lot to pay up front or on a lease just to enjoy seven seats and those Falcon Wing doors. Both the Jaguar and Tesla make some claims to being SUVs as they offer a raised driving position and each comes with all-wheel drive. 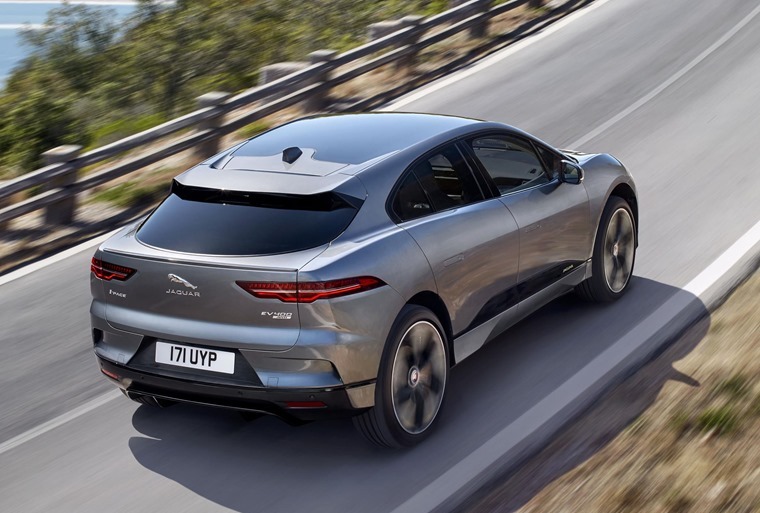 The reality is you’ll never take them off-road, even if the Jag can wade through water up to 500mm deep, so let’s concentrate on the way the I-Pace behaves when driven on tarmac. Even so, and like most BEVs, the I-Pace makes for a superb long distance machine thanks to its near total lack of noise inside the cabin. The weight of the batteries is carried low in the I-Pace’s frame, which is bespoke to this model, and spreads them evenly along the car’s length. As a result, it has a very low centre of gravity for a car that claims to be an SUV and there’s very little lean in bends. In fact, you very quickly learn the I-Pace can be hustled through corners in a way that only the likes of the Porsche Cayenne or Alfa Romeo Stelvio enjoy. The quick-acting steering of the Jaguar help here and there’s about 2.5 turns from lock to lock, so it’s pleasingly rapid to respond yet also light when parking. Once turned into a bend, the Brit holds its line very well despite 2208kg pushing down and outwards on the tyres. Our test car rode on 20-in wheels with low profile rubber, so cornering ability was not likely to be in doubt. Yet it’s the way the I-Pace feels sporty in the same way as an XF that impresses. Our one criticism is the ride quality. It’s much better than the Tesla Model X’s we’ve driven and copes far better with British roads, as you’d hope from a UK car maker. Yet it isn’t immune to being jolted off line by bigger ripples and ruts that an F-Pace just doesn’t notice. We suspect the smaller, standard 18in wheels would cure much of this. Even so, and like most BEVs, the I-Pace makes for a superb long distance machine thanks to its near total lack of noise inside the cabin. A slight whoosh from the tyres can be heard at higher speeds, but that’s about your lot. With no internal combustion engine, there’s nothing to trouble your ears on that front, yet you’ll be aware of the electric motor’s 400hp the moment you press a little harder on the throttle pedal. Shove it down hard and that 0-62mph in 4.8 seconds is entirely credible. It makes pulling out of junctions on country roads a cinch and the seamless transmission makes it a very smooth process to gather speed quickly and effortlessly. Driven with a modicum of delicacy, the I-Pace doesn’t drain the battery in the way some BEVs can with alarming ease. During our time with the car, it hovered about the same range in mixed driving thanks to the regenerative braking topping up as we slowed down. You can vary how much this retards the car when you lift off the throttle and we found the Comfort mode offered the best balance for most driving conditions. Stick with the entry-point S and you get all of the kit you could want, while the SE and HSE take the I-Pace well into the realms of luxurious. You soon become accustomed to varying the throttle pedal for acceleration and braking, leaving the brake pedal alone for all but the last moment of stopping or to hold the car at a standstill. There’s also a creep function that works like a traditional automatic gearbox to allow the car to sidle forwards in traffic but we preferred to leave this unengaged and use the throttle for this. 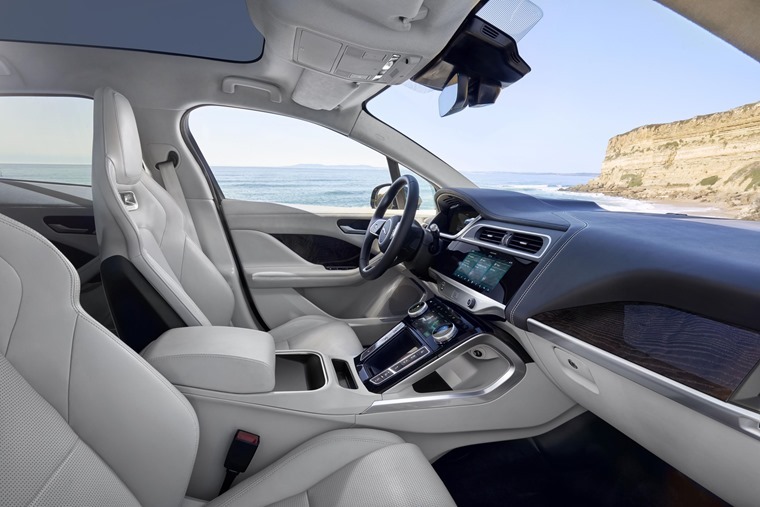 So, the I-Pace is as good to drive as it is to look at, but what about the cabin? Well, you get five decent seats and a large boot, plus it’s all finished to a high standard. The dash has a similarity to other cars in the Jaguar range, but it’s also tidily uncluttered by grouping most functions on to the infotainment screen. This isn’t as prominent as the one in the Tesla, but it’s also properly incorporated into the Jag’s design rather than looking grafted on. 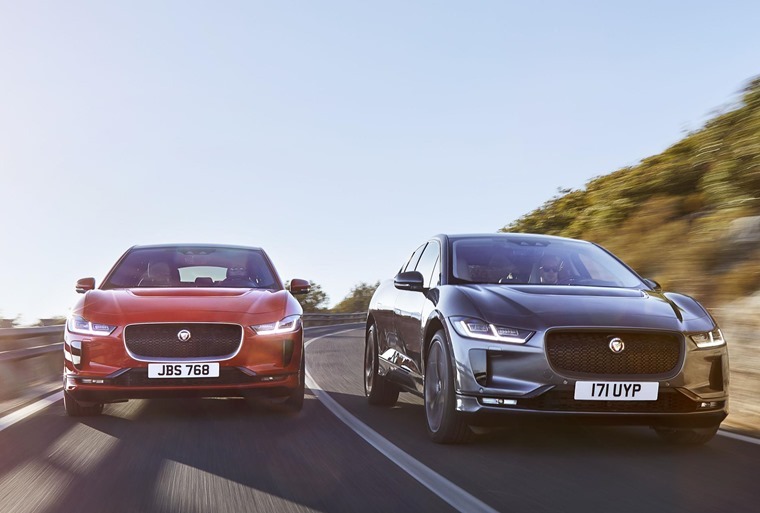 Jaguar has also retained some individual controls for the ventilation and transmission selection, which will be welcomed by those transitioning from an internal combustion-powered car. As for space, the front occupants are very well looked after, as are those sitting in the two outer rear seats. Behind those lies a 656-litre boot that’s up to needs of most owners. Stick with the entry-point S and you get all of the kit you could want, while the SE and HSE take the I-Pace well into the realms of luxurious. Yet any of these models still remains cheaper than the basic Tesla Model X. For those looking for a premium BEV, that will be enough to get tongues wagging about the Jaguar and plenty more choosing it. Beautiful. With it’s low-centre-of-gravity stance and short overhangs there’s nothing else like it currently available. Finished to a high standard. 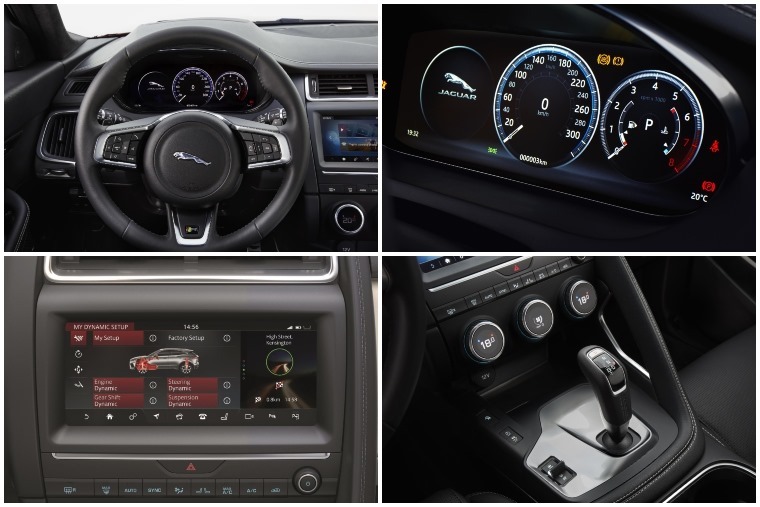 The dash has a similarity to other cars in the Jaguar range, but it’s also tidily uncluttered by grouping most functions on to the infotainment screen. The I-Pace makes for a superb long distance machine thanks to its near total lack of noise inside the cabin. Driven with a modicum of delicacy, the I-Pace doesn’t drain the battery in the way some BEVs can. The front occupants are very well looked after, as are those sitting in the two outer rear seats. Behind those lies a 656-litre boot that’s up to needs of most owners. A real-world range of 298 miles between recharges and a 0-62mph in 4.8 seconds makes pulling out of junctions a cinch and the seamless transmission makes it a very smooth process.